Barcelona-bound star Frenkie de Jong revealed he spoke to Paris Saint-Germain and Manchester City manager Pep Guardiola before opting for a move to the LaLiga champions. Barca announced the signing of Ajax sensation De Jong for an initial €75million on Wednesday, with the Netherlands midfielder set to join on a five-year deal ahead of the 2019-20 season. De Jong will remain at Ajax for the remainder of the Eredivisie campaign and the 21-year-old admitted talks were held with Ligue 1 holders PSG and Premier League champions City prior to his Barca agreement. "I am happy, proud and also somewhat relieved that it's now all behind us," De Jong told NOS. "I spoke to PSG, yes. I rang Maxwell to tell him I was not joining them and my agent informed PSG. I also spoke with Guardiola about a move to Man City. "Clubs all try to convince you when they want you. I am happy and proud that they did so much to get me. "Barcelona have wanted me for a long time, they already tried to sign me last year. But they also have their financial situation, they can't just spend loads of money." De Jong has helped Ajax reach the last 16 of the Champions League – three-time reigning holders Real Madrid awaiting. He has scored three goals and assisted the same number for Ajax in Eredivisie this term. 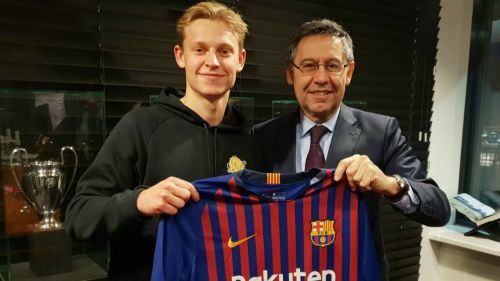 De Jong becomes the third major Barca signing of the transfer window following the loan arrivals of Jeison Murillo (Valencia) and Kevin-Prince Boateng (Sassuolo).